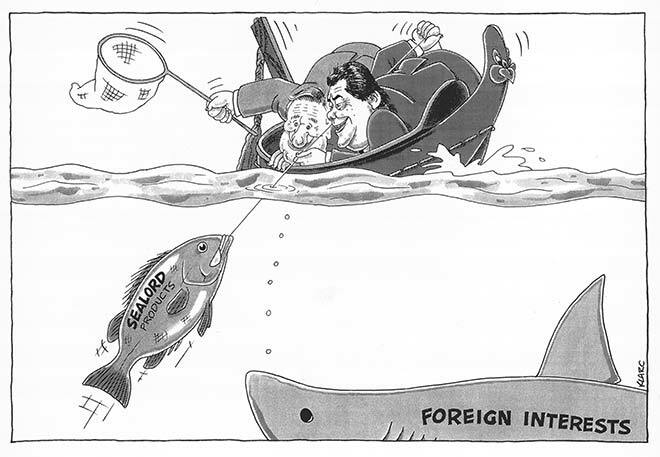 The legend of Māui fishing up the North Island is suggested by this 1992 cartoon about one of the largest and most complicated of all treaty settlements. Prime Minister Jim Bolger (left) is shown with settlement negotiator Matiu Rata, hauling the deal out of reach of predatory foreign interests. Rata was initially the leading claimant in the Muriwhenua treaty claim, which included fisheries issues later addressed by the Sealord settlement.